Research has shown that a child's muscles in the hands and fingers develop at a faster rate than those in the mouth and jaw. Basically this shows us that a child is better equipped at a young age to sign before they can speak. Because of this many people are choosing to teach their infants to use sign language as an early form of communication. It has been known to cut down on the amount of frustration on the part of an infant trying to communicate with their parents/caregivers. This would work with older children also. My daughters father is deaf and he says to stop using my voice, in general I have a problem remembering that. But is it better to teach her sign without using the voice? I feel confident that she will not have any problems later in life if I don't ALWAYS use my voice, it's not a fear. 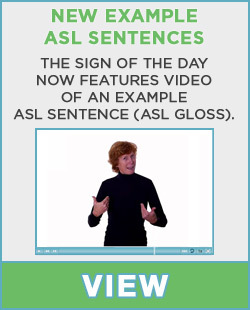 But is it better to learn sign without voice? I have an uncle who is deaf, and I am also in my third semester of ASL. We do not use our voice, since hearing people use it as a crutch. By not using voice, it forces you to think about the signs. I am a hearing person and SO excited about learning to sign! This site is amazing! My friend has a 6mo old hearing baby. I wanted to encourage her to develop her baby's signing language, it sounds like the benefits are incredible for everyone. at what age should she start her little girl? Is there any actual research that shows a "delay" in the development of speech? I can't imagine that it would, but I know some people are afraid of that. I intend to dispel the fear, but I need some help. Thank you, and THANKS Signing Savvy, for this state of the arts website! I started teaching my (hearing) daughter to sign using "Baby Signing Time" videos when she was 12 months old and it is the most brilliant thing I have ever done. She is 20 months old now and knows over 150 words and about the same number of signs. Every time she learns a sign, she picks up the word. Her speech is significantly more advanced than kids over 2 years old. She knows most of the animals at the zoo and all the colors of the rainbow, tons of food and most toys -- both words and signs. She is also starting to recognize words written down because of the way "Signing Time" teaches the word spoken and written coupled with the sign and a picture. Also, I can tell my daughter something from a distance without shouting, which is a nice plus. Seriously, every child should learn to sign. I'm happy to see the questions and responses around this topic since I have a great passion for teaching language to young children and find it so fascinating to watch. The questions about whether to voice or not is really more of a personal preference one. Some deaf people use their voices in some situations and others never do. If you are teaching sign to a hearing child though it would be fine to include the verbal word in conjunction with the sign. 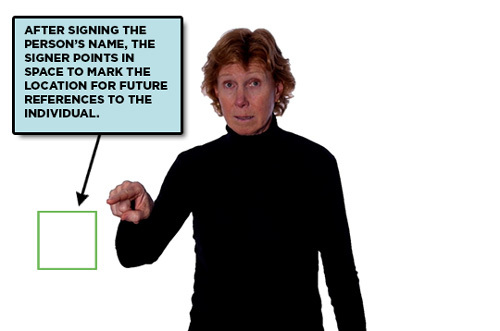 For those who are learning...and using strict ASL (American Sign Language) you would not use your voice while signing. Again though...this is really up to you and your personal preference. You will find research out there that supports both ends of the spectrum as far as whether or not it helps or hinders speech to teach a baby sign before they are communicating through speech. I personally have never seen a child, whether with normal hearing or hard of hear choose signing over speech as their body matures to the point that they can actually do it. (Much like you normally won't see a child crawling once they have learned to walk.) The child is going to naturally use whatever system comes easier to them as they mature. Because of this, you are not going to see a child with hearing rely only on sign language as their main source of communication. Most the people who come up with that research are oralist who just are opposed to sign language in any form with any child. As far as what age to start....NOW...I don't think a child can be too young. We would never say, "At what age can I start talking to my child?" So why say' " What age can I start signing?" Just remember though, you will not be signing everything to them or signing with them like an adult, just like you wouldn't talk to a baby like an adult. Thank you for your responses, Elizabeth and John! I'll definitely look for the baby signing time videos for my friend. I started teaching my hearing daughter to sign at 4 months. I watched the Baby Signing Time dvd's and taught myself the basics, and would sign to her when I said the words I knew the sign for. At six months old, she signed "milk" to me. She didn't really start picking up on anything more until about 11 months old, where there was an explosion of all the signs I'd been teaching her, as well as her learning new ones after only a few days of being exposed to them. She was a year old on 9/3 and currently knows - and actively uses - the signs for: milk, more, cereal, book, water, noodle, banana, change (for diaper changes), eggs, cracker, cheese, bean (as in string bean), bird, cat, baby and daddy. She understands what she's saying and will get frustrated if we don't recognize her attempt at a new sign as well...lol. I always recommend signing to people with babies and small children. Sometimes I'm scoffed at (and even told that babies don't have the ability to learn sign) and other times I'm met with fascination and questions. I've actually even had my mother in law say to us (after hearing we were going to sign with her), "You ARE going to teach her how to READ still, aren't you?" as if people who can sign can't read???...lol. I know that for us it has been a wonderful tool to better communicate with out daughter, and it shows in the excitement on her face when we understand what she's signing. I recommend that those of you interested in signing with your children also check out You Tube or related videos of babies and children signing because many times their version of the word is very different than the sign itself. If not for watching other babies sign, I wouldn't have known that my daughter was signing bird or cracker. My 26 month old has Down syndrome, and our whole family has been learning sign. I have refered many parents of children with Down syndrome to this site because it is so wonderful for kids with DS. They tend to be very visual learners, and can sign long before they can speak. My daughter knows well over 100 signs, and uses them as her main form of communication. Learning to sign has been a family hobby - we love it, and I agree - signing is great for every child. I was employed as a nanny for several years. The girl I was watching became frustrated around 8 months old over her inability to communicate. I began sign language with her. within 24 hours we had "milk", "water", "mommy" and "daddy" down. Her parents were flabbergasted! By the time she was approaching her 2nd birthday she knew over 100 words. I have a six year old with autism, who until last year was functionally non-verbal. After about two weeks of watching Signing Time, and my learning signs as well, she had picked up about 25 signs. Now, a year on, she knows about 300 signs, her verbal skills have progressed through the roof, and she's even taught signs to my 3 and 1 year old nieces! if i only want join the monthly member for this month, how can i cancel it for next month? This question is off-topic, but I will answer it here since it was asked here. You can cancel a monthly subscription anytime and your membership remains until the end of your payment period. You can cancel by logging in and clicking on the link to account info in the upper-right hand corner. On the resulting page is a link to cancel your subscription. Follow the steps outlined there. What an interesting thread. I am a pre-k teacher in a public school and this year I have started to teach my pre-k students to sign. They adore it. It's October and they know the days of the week, their colors, how to count to 10, how to ask to go to the bathroom, and a variety of other signs we use in school. I have a few children who find it difficult to speak in a group but they have no trouble signing. I am doing screenings on all my children and one child signed the color of the object he was examining. Without that he would have failed the screening because he doesn't speak yet but clearly knows about things. Learning ASL is the best thing I have ever done for myself and my students. And my parents love it also. My kids go home and teach their parents. One of my students had a stomach virus the other day and mom picked her up and took her to the doctor. In the office, my student signed "bathroom please" The other patients were amazed. Learning a second language is a great skill for anyone but with children I think it helps them develop a better understanding of language.. Recently Signing Savvy served as a "real-world client" for an Apprentice-style project management class at Michigan State University. As part of the project, one group of students created an informative video walkthrough of some of the features of the Signing Savvy website and placed it on YouTube to help promote the site. The video is below.